As I mentioned in my intro to this project, I'm a slow reader. I'd like to have a Bond post up each week though, so I'm going to write about however much of the books I've read in the last seven days. Hopefully, that'll also help control the length of some of these posts, because I do tend to ramble. Before Casino Royale was even published, Ian Fleming had completed his second Bond novel. 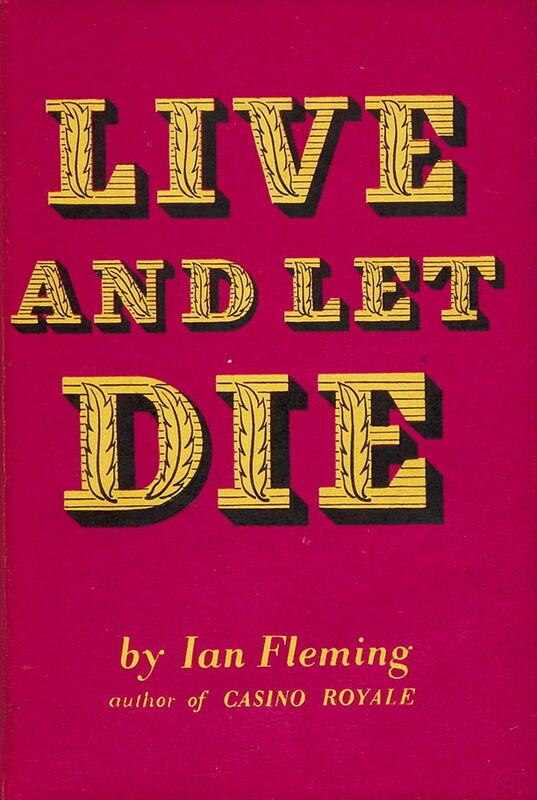 Inspired in part by the train ride that Fleming and his wife took from New York to Florida before heading to Jamaica where he wrote the book, Live and Let Die has Bond making the same trip as he investigates a criminal named Mr. Big. Like Casino Royale, Live and Let Die begins with a cold open as Bond arrives in New York City to collaborate with the CIA and FBI, then flashes back to the briefings that sent him there. Bond has mostly recovered from the events of Casino Royale, but still carries emotional scars. How much damage he took from Vesper's betrayal remains to be seen, but at the very least he's passionately bent on taking down SMERSH, the Soviet organization behind most of the troubles in Casino Royale. M knows this, so when a possible SMERSH agent is identified in the United States, M gives Bond the job of verifying the intelligence and - if necessary - eliminating the threat. The connection between Mr. Big and SMERSH is circumstantial. The British have reason to believe that SMERSH is financed partially by a horde of pirate loot that once belonged to Captain Morgan, and Big has been caught handling some of that treasure. On paper, part of Bond's job is making sure that Big is actually involved with the Soviets, but that fact is mostly taken for granted. Bond is after Big from the get-go. My first reaction to The Monuments Men was how sad it is when art about the importance of art largely fails to communicate the importance of art. That’s what I tweeted right after I saw it, but I’d like to unpack that complaint a little more. 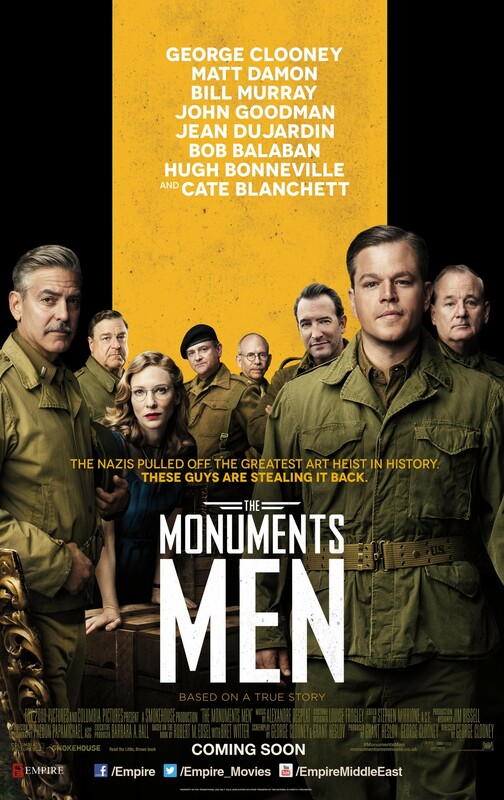 The Monuments Men spends a lot of time telling its viewers that art is important. George Clooney’s character assures the people around him (multiple times) that art is what the Allies are really defending against the Nazis. Art, he claims, is the memories of a civilization. An entire generation can be wiped out, but the culture will endure as long as its artifacts do. His character arc is to discover just how much he thinks this is true. As his team lands in Europe he cautions them to be careful, saying that no piece of art is worth their lives. By the end of the film, he’s changed his mind about that. In a hammy scene, he debriefs FDR who pointedly asks if the mission was worth the loss of life. Clooney’s character proudly declares that yes it was. He’s clearly taken a journey in the film. The trouble is that I didn’t get to take it with him. Ian Fleming always intended for Bond to get out of the books and onto the screen. 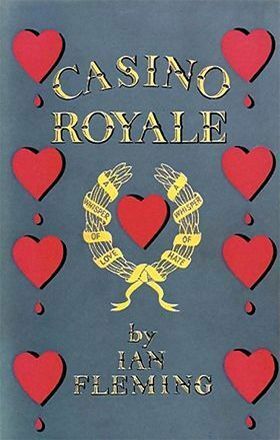 In fact, the US edition of Casino Royale had only been out several months when it was adapted for TV by the hour-long, suspense anthology series, Climax. 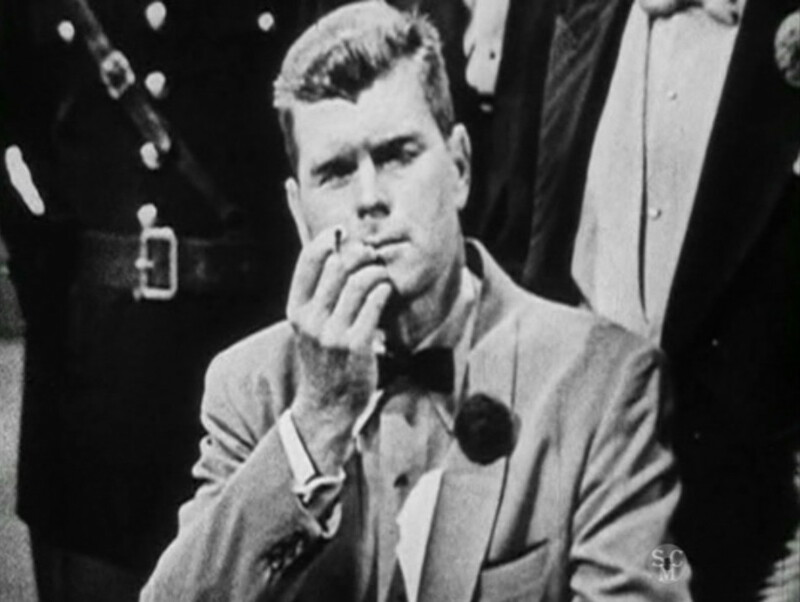 “Casino Royale” was the show’s third episode following an adaptation of Raymond Chandler’s The Long Goodbye and the Bayard Veiller play The Thirteenth Chair (which had already been made into three different movies, one of which was directed by Tod Browning and co-starred Bela Lugosi). The show was kind of a big deal. Though the few, remaining prints are black-and-white, the series was actually broadcast in color, which was rare in 1954. It was also hosted by film star William Lundigan (Dodge City, The Sea Hawk). But Fleming would come to regret the hastiness with which he accepted the Climax deal and it’s not hard to see why. The show famously changed James Bond into an American CIA agent named “Card Sense” Jimmy Bond, and while that was the most obvious and horrific alteration, it wasn’t the only one. The Le Chiffre job is still an international operation coordinated by Britain, but Her Majesty’s Secret Service is represented by Clarence Leiter (replacing the novel’s American Felix), who says he works for Station S (the MI-6 branch in the novel that comes up with the mission). Clarence bankrolls Bond’s initial gambling stake and even debriefs him on the mission, a la M. Bond himself is clueless about the case when he arrives at the casino and at first assumes that he’s supposed to assassinate Le Chiffre. When people talk about how they came to know James Bond, the story I most often hear is that they were introduced to the movies by an older relative. When I was a kid in the pre-cable, pre-home video ‘70s, that meant catching the old movies as they aired on network TV. I remember those commercials well and my being intrigued about the suave hero who’d been around long enough to be played by multiple actors and whose adventures had awesome titles like Thunderball and Live and Let Die. The Bond films were family viewing for a lot of folks and it didn’t matter that they were only available sporadically and in whatever order the network chose to show them. There was no way to marathon the entire series in those days, but no one cared. They fell in love with Bond anyway. I didn’t get to know Bond that way though. My folks were pretty strict about what we watched and the sexual nature of Bond’s exploits kept him off our TV. It wasn’t until I was 16 and able to drive myself to the movie theater that I saw my first Bond film. But long before then, I was able to enjoy his adventures in a different format. For whatever reason, my folks never policed my books. If I could find it in the library, they were okay with my reading it. So while I was unable to satisfy my curiosity about the Bond films, the world of Ian Fleming’s novels were completely open to me and that’s how I met the superspy. And since I was a compulsive nerd about continuity even then, I had to start with the first book, Casino Royale. It blew me away. James Bond has been on my mind a lot lately. It's due to a couple of things that have fed off each other. First, I love introducing my son to awesome things and have always impatiently looked forward to a time when he could appreciate stuff that didn't necessarily have giant reptiles in it so that I could introduce him to Bond. This past year he watched Commando with me and liked in in spite of its lack of dinosaurs or kaiju, so I started thinking that he might be ready. He was only 11 though, and in my head I was waiting for him to turn 13, so I held off for a bit. But in the last part of last year a couple of Bond podcasts started and I've been listening to them. Pod, James Pod is run in part by my pal CT from Nerd Lunch and is a fun if meandering discussion of the Bond films in more or less random order. Then there's Nerdist's James Bonding with Matts Gourley and Mira, an only slightly more structured look at the films that started at both ends of the series (first Dr. No, then Skyfall) and is working towards the middle. All this Bond talk got me interested in watching the films again, so I sped up my time table with David and we've been watching them in order with Diane. Which has me wanting to talk about them myself. I don't have a podcast, but I do have this blog, so I thought maybe I'd write a series of James Bond posts as sort of a follow up to last year's Tarzan celebration. Since I won't be working through a book like Tarzan: The Centennial Celebration, the format will be different for this. I'm going to read the books and watch the movies and write about all of them in the order they were produced. That means that I won't be able to make this a weekly thing at first while I'm in the novels, because I'm a very slow reader. Once we get to the movies though, things should pick up. I'd planned to use this particular post to talk about my own background with Bond and explain the format for the reviews, but I think that I'll save both of those things for later as we get into it. I'm really looking forward to this and am going to make it as comprehensive as I can. 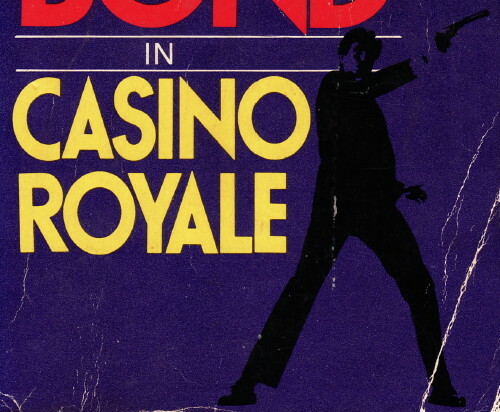 See you Monday with a discussion of the first Bond novel, Casino Royale. Paul Greengrass has constructed an exciting thriller out of real-life events, which isn’t always easy. Though I’d be lying if I said that Captain Phillips maintains its tension for its entire run time, it joins Ben Affleck’s Argo in keeping me glued to the story even though I knew how it was going to end. That said, the movie doesn’t let me get to know any of its characters super well. It reveals enough to make me care about what’s happening to them, but I don’t really know what makes any of them tick. The opening scene is a conversation between Phillips and his wife that I imagine is supposed to reveal the stakes for Phillips, but it’s the weakest part of the film and doesn’t actually disclose anything more than it would to just show a picture of his family on his desk. 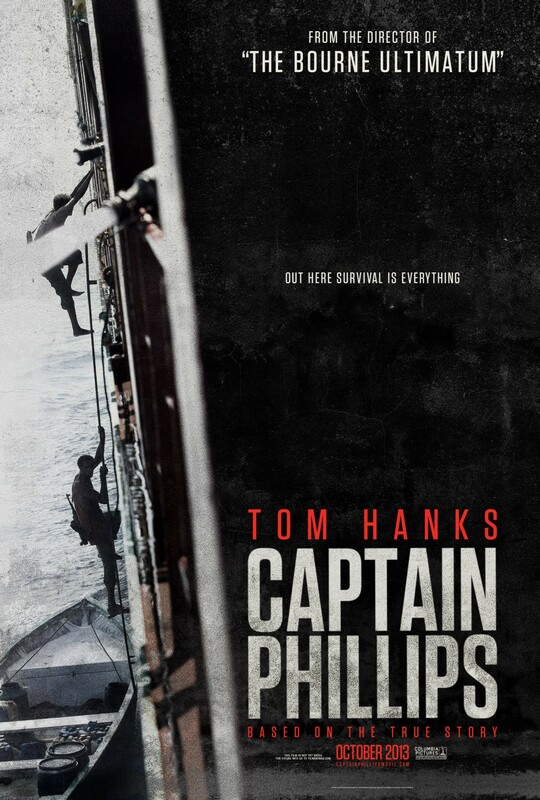 The most remarkable thing about Captain Phillips though is that it gives the Somali pirates as much attention as it does Phillips and his crew. That means that I didn’t get a lot of detail about their lives before these events, but I got enough to make me care. The pirates aren’t a cookie-cutter band of cutthroats; they each have individual personalities and – I presume – reasons for doing what they’re doing. I would have loved to have seen some of those reasons on the screen, but it’s notable that the film makes real characters out of them at all, going so far as to draw specific parallels between them and their victims. That comes out in a couple of amazing scenes between Phillips and the leader of the pirates, a man named Muse. In the first, Muse is bragging about a Greek ship he took the previous year that was worth six million dollars. “Six million dollars?” Phillips asks him. “So what are you doing here?” The expression on Muse’s face says everything. That’s not his money. What’s heartbreaking about it is the realization that this life and death struggle between all of these men is actually about someone else’s profit. The Somali warlords and the shipping company that employs Phillips are the ones who have created this situation, but its Muse and Phillips and their men who have to play it out. I love that. Whatever Damon thinks is at stake, it’s nothing compared to the people who still have to live in Iraq once the US has left. Even though I knew that intellectually, that scene hit me in a powerful way and made me remember that when nations get involved in each other’s business, there’s much more at stake than politics. In its own way, Captain Phillips reminds me of that too. I've had Michael Stearns' webcomic Dawn of Time bookmarked to read for a while now and have finally had a chance to finish it. This post isn't a full review, but it's definitely a recommendation. The strip is about a prehistoric girl named Dawn who hangs out with a triceratops named Blue. It's not just a bunch of cute adventures (though it has those, too), but Stearns builds an actual, epic story featuring Victorian time travelers, alien gods, and the relatively more civilized people of Dawn's world. It's fantasy, not science-based (as if her living side by side with dinosaurs isn't clue enough), but that's a big part of what keeps it fun. Since Stearns' imagination trumps everything else, anything can happen and usually does. It's a complete strip - Stearns wrapped it up in 2011 - and there's enough to it to make it worth investing time in, but there's not so much material to make it daunting to start from the beginning. It's a really great read, so do yourself a favor and check it out.